A proactive response to reductions in Government funding. The 2017/18 Commonwealth Budget made what some describe as ‘catastrophic’ changes to funding for higher education. This course takes a proactive response to the inevitable disruption funding formula changes drive. The course examines revenue and expenditure opportunities to ensure higher education providers survive and thrive despite funding reductions. SUPER EARLY BIRD RATE $1,895 (SAVE $300). PLEASE SEE PRICING FOR MORE DETAILS. Higher education is vital in upskilling the workforce in a global economy and the Australian higher education sector is a major source of export earnings of approximately $20 billion per annum. 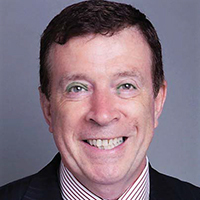 Higher education funding has been on the Commonwealth Governments radar for the past three years and changes become a reality in 2019. The time for strategic planning on how to survive and thrive, despite funding decreases, is NOW. This practical course examines and reviews the higher education funding model to define a sustainable higher education business model. The review ensures all options are considered noting different providers will choose different options to meet their specific needs. The facilitators experience as a long-term Cost Management Specialist will blend with participant’s insight to stimulate a practical and achievable way forward for each participant to stimulate debate back at their workplace to assist all decision makers plan to survive and thrive. Enterprise change is never easy. Funding reductions drive change and impact broadly. This course will assist participants and their employers in managing both the change and the impact to achieve a positive outcome for all stakeholders. How significant are the proposed changes in Commonwealth Government funding for Higher Education? 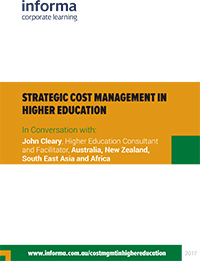 How will strategic cost management in higher education course assist?